Chicken Pot Pie wasn’t a meal my mom made very often when we were kids, but whenever I had the opportunity to have it, I enjoyed it. 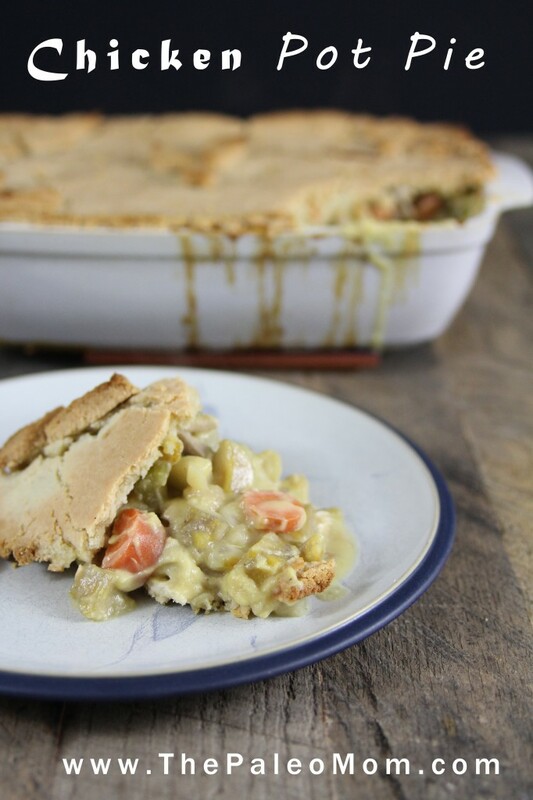 Chicken Pot Pie is a wonderful way to reinvent chicken or turkey leftovers. I always roast two chickens at once, and this is an awesome alternative to eating the same meal as leftovers for 4-5 nights! This recipe calls for cooked, leftover chicken, cut into pieces. If you want to make it from fresh chicken, simply bake the chicken for 350F until it reaches 160F (how long that takes will depend on how thick your chicken is and whether or not it has bones, or is a whole chicken, etc). 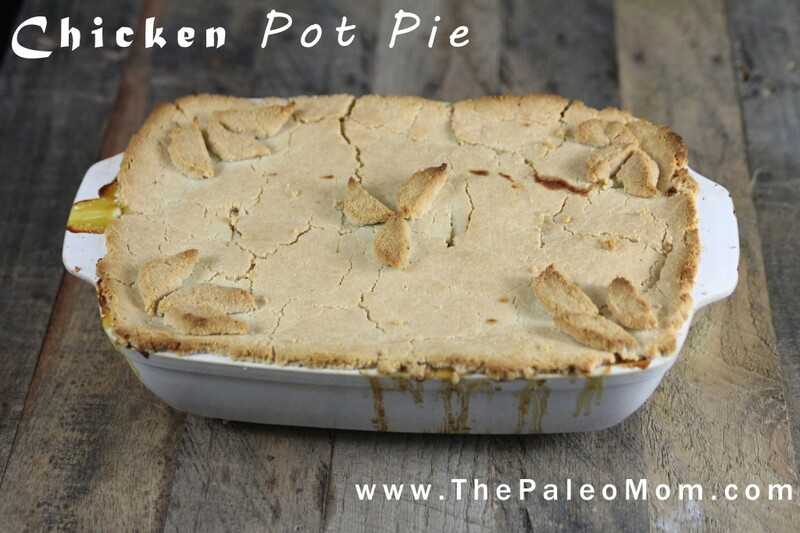 Classically made with a cream sauce, thickened with flour, and lots of potatoes, topped with pie pastry, there’s a few challenges to creating a Paleo-friendly version of Chicken Pot Pie. Even though I had a fantastic strategy to create a creamy sauce, I was still face with a major challenge: the crust. Until recently, I had yet to figure out how to create a Paleo pie crust that could hold together well enough to top a pie (most Paleo pie crusts are pinch crusts, where you form the crust right in the pie plate rather than roll it out and then transfer to the pie plate). Pie crusts are one of those things that I have never enjoyed making. I’ve never been particularly good (or patient) at making pie crusts, especially when it comes to topping pies. And I’ve always found making pie crusts to be annoying (at best). But, I still have experimented with different versions periodically over the last couple years. I finally hit upon a pie crust winner a couple of weeks ago. The addition of a little starch to almond flour helps the pie crust hold together so much better, plus it improves the flavor and turns this crust from a vessel to a contributing member of the dish. It’s still a bit finicky and I admit that transferring the crust from parchment or a silicone mat to the top of this pot pie was a little harrowing, but it held together well enough that even I (who has very poor pie pastry skills) was able to make it look pretty good. Substitutions: I always get asked about substitutions. 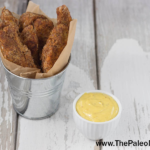 I think that any finely milled nut or seed flour could substitute for the almond flour, but I have not tried (although I have plans to try one with sunflower seed flour over the holidays). I don’t think it would be easy to substitute coconut flour. I think that another starch like sweet potato starch or tapioca could substitute for arrowroot powder, but again, I haven’t tried. 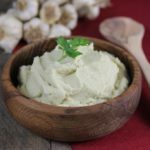 I can’t recommend any substitutes for egg whites, but if you try something, feel free to comment on this post and let people know if it works. You can be creative when it comes to vegetables for the filling though. If you enjoy peas or green beans in your chicken pot pie (and tolerate them well), then go for it! AIP modification: This is delicious even if you skip the egg yolks in the sauce (that’s really about not wanting to throw out the nutrient-rich egg yolks leftover from making the crust) and just go for a crustless version. Simmer cauliflower and whole clove of garlic in broth in a medium saucepot until cauliflower is soft (about 20 minutes, depending on the size of the florets). Temper the egg yolks. Whisk the yolks in a small bowl. While whisking, add a little of the hot pureed cauliflower. Then place the tempered yolks back into the blender and blend again for a minute to incorporate. Heat lard over medium-high heat in a very large frying pan or small stock pot. Add onion, celery, carrots, and rutabaga. Cook, stirring occasionally, until vegetables are cooked al dente, about 20 minutes. Add plantain and chicken and cook until both are heated through and plantain is starting to soften, about 7-8 more minutes. Channel your inner playdough-loving self, and press into a large rectable about 3/8″-1/2″ thick on a piece of parchment paper or a silicone mat. This is a little easier if your dough is cold. You’re aiming for your rectangle to be the same size or slightly longer than the size of your casserole/lasagna dish. If you make the crust in advance, you can place the dough in the fridge and then press it out when you’re ready, or press it out in advance and then place your whole silicone mat in the fridge until you’re ready. Pour the filing into a large rectangular casserole/lasagna pan. Carefully transfer the pie crust onto the top. Trim around the edges with a knife and use any leftover crust to form decorations if you want (leaves are classic, but you can be as creative as you want here). Put a few cuts into the crust for steam to escape. Place the whole kit and caboodle onto a rimmed baking sheet (in case it boils over while cooking). Bake for 40 minutes, until crust is golden brown. Enjoy! I think the base would… not sure about the crust. Its freezes great….crust and all! This looks great, thank you! Just one thing: Is the plantain sliced, cubed, diced? I’m assuming cubed, but wanted to check for sure! Have pre-ordered both your books, can’t wait! Happy Holidays to you and yours! Oh yes! Thanks! Edited the post to clarify. 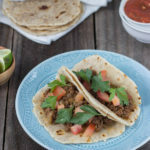 Making this for dinner tonight – so excited!! Please can you tell me where I can buy coconut flour from in the UK? I just put the “whole caboodle” into the oven, but I just had to comment because the cauliflower broth was just amazing. I never thought I could make a cream of chicken without milk, and you made it happen… brilliant! Thank you for this recipe! I made this tonight with leftover turkey and had kids hanging around for the oven timer to beep – it smelled so good cooking. Everyone liked it, including my son who is very picky and generally unimpressed with Paleo (he’s turning 13 soon so he gives me teen angst about Paleo every chance he can.) I had some gluten free pie crust leftover that I used for the top. Next time I’ll try your almond flour crust. It’s like one of those sneaky recipes – the kids don’t know how many vegetables they are eating – and that they are eating plantain, something they otherwise would turn their noses up at. I bet it would taste great as a beef version with ground beef or leftover chopped steak or roast too. This has almond meal in the crust. That’s not AIP safe. Am I missing something? I’m wanting to start AIP and am gathering recipes. I found this one on your AIP list. Thanks for your time and your awesome site. Never mind. I saw the note for taking the crust out. Darn. Made this tonight. I love the concept but found it to be very bland. I will have to jazz it up next time. Hello there…just made this. In the oven as we type. One question, my crust was very crumbly. It would come together, but not hold well and the transfer…well, it is more of a crumbles hen a pie! Any suggestions? It holds together a little better if the dough sits for a while and then if you very firmly pack it together. I had to add more egg whites to make the crust stay together! I should have read the comments before I started. Just put it in the oven – my crust was crumbly too, so I ended up sort of pressing it straight on to the top in bits. Looks more like a crumble topping than a pastry. Will have to try more egg whites next time. I loved this. I have to admit, I’m not an almond flour fan. I tried to make the crust, but mine was crumbly, too. I do now see the advice in the previous comment about letting it sit longer. I think my body doesn’t like it anyway, and I should probably just stop trying… but when I picked off the crust, I loved it, as did my toddler. So if people are worried about AIP (I don’t follow it and don’t know the details), no worries. I added a little more pink salt, but otherwise made this as written (parsnips for plantain). 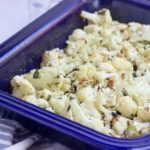 The cauliflower cream sauce is brilliant and the rest of the recipe can be played with to suit tastes. I want to add tarragon or thyme next time and maybe some green vegis like broccoli or green beans. This is perfect for this crazy cold winter and will last us several days. I’m already looking forward to lunch on Tuesday! Thanks! I had to sub some of the veggies based on what I had. I used sweet potato, carrot, green beans, and peas. I used less almond flour than called for, since I was adding it gradually and it got crumbly way before 4 cups. I squished it out thin between two layers of plastic wrap, and it turned out a lot prettier than I expected. It took me forever to make this from start to finish, and I think it would have been better with some less-sweet veggies, but it was still pretty good. I severely miss potatoes!! Sweet potatoes just aren’t the same. Thanks for the recipe! Try Rutabaga’s (sp). I have pretty much changed them out for regular potatoes and what they do to potato salad is heaven. We made this tonight and I got a horrible upset stomach. Then I googled arrowroot and learned that many manufacturers sell tapioca as arrowroot. I pulled out my bag and sure enough, it claims to be arrowroot, the line below says “manihot esculenta”. This translates to TAPIOCA…. Ouch, I cannot digest tapioca. Please be safe in selecting arrowroot and ensure it comes from the actual arrowroot = maranta arundinacea. 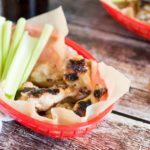 I gave a tweaked version of this recipe a try last week and we LOVED it! I didn’t have time to make the crust so we ate the filling as soup. It was delicious, can’t wait to test the crust out next time! Thanks for sharing this yummy recipe! this was delicious! thanks – i added up the calorie count on myfitnesspal and is estimated: 320 cal, 20 carb, 14 protein, 21 fat per serving. this is with using a sweet potato instead of the plantain. 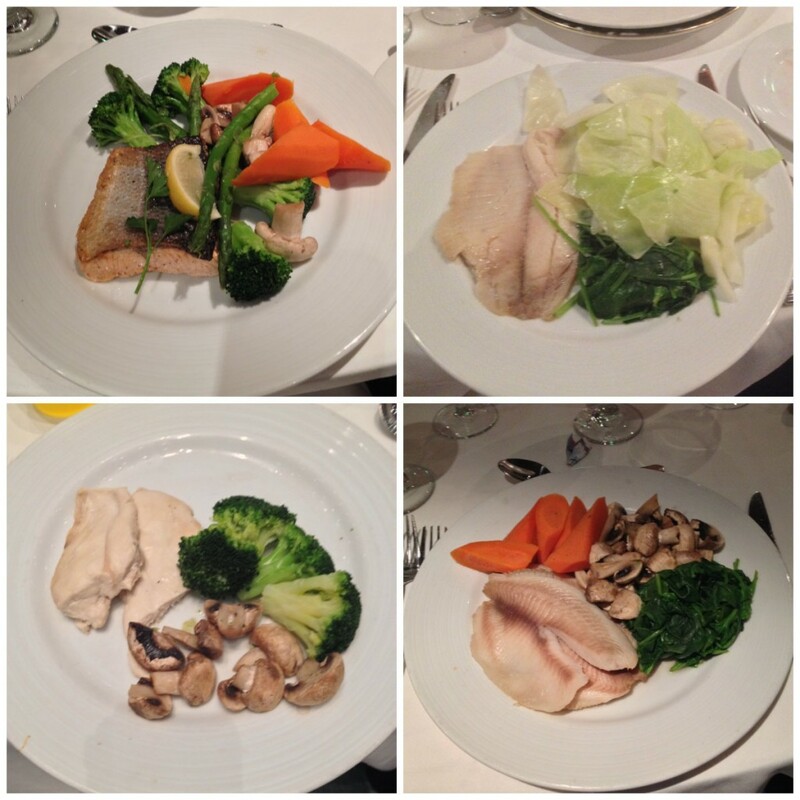 Loved this recipe but definately a sunday afternoon meal – took a while to prepare!! Thanks.!! Could you make a bottom crust too? Pre-bake it, fill it and top with a second crust? Thoughts?? So we can have almond flour but not almonds? Forgive this possibly silly question! For the AIP version, is it done after the cauliflower sauce is added to the chicken and veggies, or would I still bake it in a casserole dish for 40 minutes, just without the crust? Could you use Coconut Flour in the crust? How much would you use? I just made this – yum! It was definitely a more time consuming recipe to make. I like the sauce – I think that’s what really sets it off. I used chicken breast I cooked in a pan with lots of seasoning, then shredded. My dough was really dry… but I didn’t want to mess with it so it ended up being more of a crumble on the top (still yummy!). Do you think the sauce would freeze well? Just thinking of make ahead items. Ummm, you are CLEARLY reading my mind!! 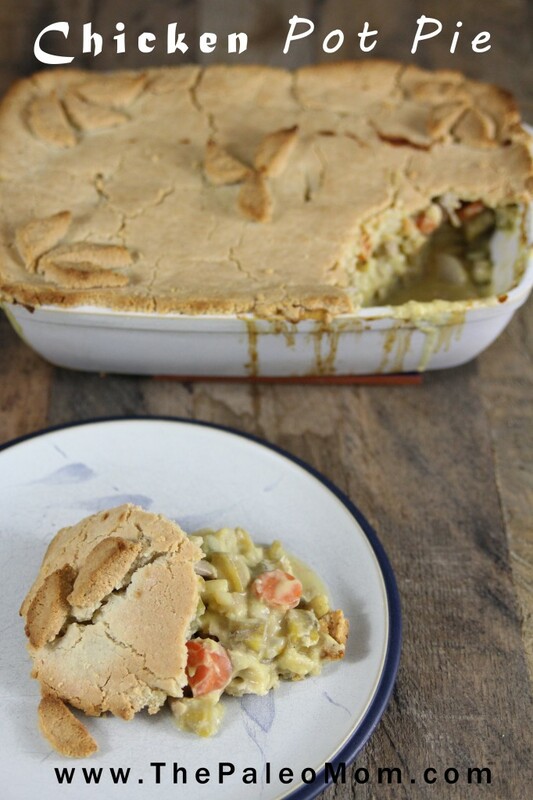 I miss a good, warm comfort meal like this so I can’t wait to try this pot pie recipe. I’ve been reading through the comments for some other tips and I’m going to make it this weekend. I just need to get my veggies at the market and I’ll be good to go! Thanks! This was a perfect meal for a cold winter night! I can’t do eggs, so I subbed flax/water for the crust and it was yummy! I did add a little extra water to make it hold together. I tried to roll it out on a greased flexible cutting mat and it rolled pretty well. However, the transfer wasn’t so pretty. Tasted delicious though! Next time, I’ll just pat a few rounds of dough in my hands and lay them on top of the pie – kind of like the type of pot pie that you place biscuits on top of. Can’t wait for leftovers tomorrow! Thanks so much for sharing an egg-substitution! This pot pie sounds heavenly, but eggs are a deal breaker due to allergy. Did you add flax egg to the sauce as well, or just the crust? I am sooo incredibly thankful for this recipe. My family use to live on Marie calendars pot pies. 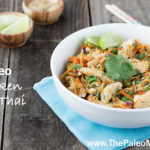 I had to become gluten free then Paleo and I’ve tried sooo many recipes and I LOVE THIS ONE, IT’S GREAT! The sauce is great. I forgot to use the new potatoes I wanted to use, so I have carrots, celery, onion and Turkey in mine. I did have to add one more egg white to finish brining my crust together. I brushed the crust with butter before cooking. I also added poultry seasoning and trader Joe’s 21 salute seasoning and salt. It’s flavorful. The crust tastes great and crunchy. I made then into personal pot pies. Thank you sooo much! Oh my goodness! This is so delicious! I made this with leftover turkey and mashed cauliflower. I’m AIP so I made the crust out of yucca (just boiled it, put it in a blender with avocado oil, patted it out on a cookie sheet, and baked it on 375 for 10 mins). It’s very good, but I would add a little salt next time and possibly brush some coconut oil over it after placing it on the filling. I used leftover turkey gravy (thickened with arrowroot powder) to make the cauliflower more “saucy” and added some roasted garlic. I used turnip and hannah yams instead of rutabaga and plantains. The finished product is way more delicious than I expected. I will definitely make this again. Thank you!